We already knew Jimmy McGill/Saul Goodman as a man of fine taste. If the free citrus water outside his former nail salon office didn’t give it away, the very first scene of Better Call Saul, season one showed our hero(?) retreating to his apartment for some Dewar’s and Drambuie (aka a Rusty Nail) after the late Cinnabon shift. As Gothamist noted, this is the official drink of depressed old men everywhere. So in an almost poetic fashion, the show’s second season started off with Jimmy in a far more celebratory drinking mood. Fresh off the complex combination of his brother’s disdain, the beginning of the Sandpiper case, and a related job offer, Jimmy’s taking a little R&R to think through all the options. After his pal and possible main squeeze Kim Wexler shows up to provide the pep talk, Jimmy’s in the mood to forego the cheap tequila they initially shared and show off his con artist side. Luckily, there’s a Bluetooth wearing lark talking crudely about investors, and some $50 Zafiro Añejo shots on the menu. We all see where this is heading. What’s less obvious, however, is this soon-to-be bit of check skipping has plenty of encyclopedic alcohol knowledge behind it. 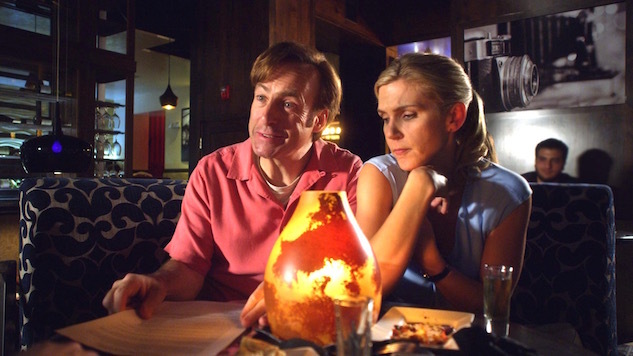 Writer (and former creator/show-runner of Breaking Bad) Vince Gilligan has long left breadcrumbs of his liquor interests within the Breaking Bad universe. Walter White famously sipped Dimple Pinch in New Hampshire because, apparently, it was a favorite of Gilligan’s girlfriend’s father. Hank Schrader chose WhistlePig after he was proven right about his Gus Fring theories because it was a personal favorite of Gilligan’s. The writer called it his favorite prop on the show that season, and WhistlePig even shipped him six bottles as a thank you. As for tequila in our favorite fictionalized New Mexico, Zafiro Añejo is obviously as good as it gets. After all, it’s a fake tequila that was designed that way. Often times when liquor is used for nefarious purposes in pop culture, brands don’t want to be associated (see booze on Sons of Anarchy for instance). And although Jimmy’s scheme is an almost victim-less crime, he’s not the first person in the Breaking Bad universe with a taste for Zafiro Anejo. That honor belongs to Don Eladio, the Mexican drug kingpin that Gus Fring tries to partner up with way back when. The man loved fine tequila and murdering people, like Fring’s partner. So when the Chicken Man came back offering a gift—of, yep, Zafiro Añejo—it happened to be (SPOILER ALERT) laced with poison. With that in mind, Gilligan knew he needed a fake fancy tequila for his world. The liquor that would entice Jimmy McGill one day is based off a collector’s item known as the “Jenny Lind” bottle, which Gilligan had prop-masters make a 3D model of in order to then do some glassblowing for the Zafiro Añejo we all came to know. Needless to say, scamming your way into a few free shots has never been this well thought out.